Making your own compost at home from your kitchen, household and garden waste is much easier than most of you think. Continue reading below a detailed beginner's step by step guide on making your own compost at home from kitchen waste at home in easy to understand way. The composting gives organic fertilizer free of cost converting your kitchen waste. Whether you live in a house or a small apartment, you can make your own compost. Composting involves decomposition of kitchen waste into humus by soil microorganisms. Humus present in compost is very beneficial to the garden soil. It enriches the soil by releasing vital nutrients into the garden soil, improving the soil fertility. lawn clippings, shredded paper, etc. Turn with a fork to add air. MAKING COMPOST AT HOME is easy and painless. Years ago, when I was living in India in a huge complex, our cleaner used to throw all the garden waste (grass clippings, fallen tree leaves, etc.) in a separate area in the corner of the complex. Also all the 9 families living there used to throw their kitchen waste into the heap. Little did I know at that time that the heap was converting into a garden gold, rich in humus. I am making my own compost for the last 15 years by recycling all of my garden and kitchen waste and using this homemade compost for growing vegetables, fruits, herbs and fruits in my kitchen garden. I think, it is a good way to help the environment, and it is free too. Best way to recycle the kitchen and garden waste which would otherwise go to a landfill. Soil conditioner. You can mix compost in soil and also make compost tea to apply on plants. Compost improves the soil quality by releasing rich nutrients into the garden soil. The microscopic organisms within compost help to prevent plant disease and aerate the soil and break down organic material for the benefit of plants. You can reduce the use of chemical fertilisers. It saves money because you need not to buy fertilizers. 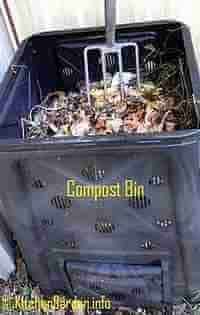 It is free, you can make your own compost at no cost or little cost. Nitrogen stimulates the growth and reproduction of organisms to oxidize the carbon components. The green ingredients include kitchen scraps including fruit and vegetable scraps, grass clippings, dead flowers, garden weeds, seaweed, kelp, tea leaves and tea bags, coffee grounds and coffee filters, etc. The carbon component supply the heat to the compost pile. However, an excess of it will take a very long time to break down. These are generally drier and are brown. The carbon rich and nitrogen deficient things include leaves, dead plants, woody twigs, straw, hay, pine needles, wood ash, shredded newspaper, cardboard, sawdust, corn cobs, dryer lint, vacuum cleaner dust, Human and animal hair, etc. Moisture encourages decomposition. Your compost pile should be only moist. Oxygen enables the decomposition. To introduce oxygen, turn the components periodically. Setting up a compost pile at home is quite easy, even if you live in an apartment. Follow the following steps to make compost from kitchen wastes. Choose a site in full sun or partial shade in a well-drained area. The site should provide air circulation on all sides. The question is whether to buy a compost bin, tumbler or making a pile. A free-standing compost pile is as effective as a compost bin or compost tumbler. The free standing pile or bin should be 3 to 5 feet in each dimension with a lid. If you buy a compost bin, it can be round or square. The compost bin is idle choice for apartment, where you can keep it in balcony or terrace. I started my first composting experiment by making a rectangular box using old wooden fence. This box allowed free flow of air to the pile. You can make your own compost bin by using chicken wire, old wooden fence, concrete blocks, or bricks. You can also use a metal cylinder with hundreds of large holes punched in the sides. If you don't have anything of the above, just start your compost pile in a corner of your garden. It is better to have at least 2 bins or piles. I use the compost from 1 bin and continue filling the other. Whatever container you make, keep in mind that it should have provision from all sides to allow air circulation. Air allow microorganisms such as bacteria and fungi to develop and help accomplish the composting. Dig the soil underneath before you begin to fill the area so that worms can enter the pile. Base Layer: Lay a 15 cm (6 inch) thick layer of coarse material such as twigs as a base layer. This is for providing drainage. On the base layer, put a 3 to 6 inch layer of green ingredients. Put a 3 to 6 inch a layer of brown ingredients on the green layer. Sprinkle some water to keep the heap moist but not wet. Repeat steps 2 to 4 until you have reached a height of about 1 meter or more. Cover with paper clippings or soil to prevent flies, growing mosquitoes and foul odors. Cover the lid of the bin. If composting in open, cover the pile with an old blanket or old carpet so that rain does not soak the pile and slow composting. The ingredients of the compost pile, moisture, air, and the microorganisms in the pile generate heat inside the pile which helps in composting. A temperature around 55°C (130°F ) is ideal, large piles heat more quickly so a pile size of 3 to 5 ft is good. A smaller, cooler pile will take longer to decompose. Leave the pile to decompose. Make sure that the pile does not dry up, moisten it with water every 2 weeks. How do you know when your compost is ready to use? Your compost will look dark brown and smell earthy.When the compost is ready, the volume of pile will reduce and its color will be dark brown. The longer the compost is left, the particles will become finer. This is anaerobic composting as you are not adding any additional air to the system. The compost making process becomes faster by turning the bin or pile and/or adding compost accelerators. The above layers will decompose into a rich compost in 3 to 6 months. To speed up the process, turn your compost with a garden fork on a weeky basis to keep it well aerated. Turning introduces fresh oxygen into the pile makes the composting process faster. This way of composting is known as aerobic composing. There are certain annual and perennial plants that can be added to compost heap to accelerate the composting process. You can add a few leaves and flowers of these plants whenever you add the green layer for making compost faster. Following plants will accelerate the decomposition of the compost and also make the soil nutrient rich. Comfrey adds potassium, nitrogen, calcium and phosphates. Yarrow adds copper, nitrates, phosphates and potash. Seaweed and kelp add trace minerals. Dandelion adds copper, iron and potash. Nettles adds iron and nitrogen. I grow comfrey (how to grow comfrey) in my garden and I throw some comfrey leaves in my compost heap. I also drop earthworms into the compost bin whenever i find them in my garden. Chopping all the ingredients into smaller size will help decomposition to occur faster. Grass clippings should be sprinkled into the bin with other materials, avoid putting in layers. Thick layer of grass clippings will reduce aeration, slowing down the composting process. Keep the amount of greens and browns roughly equal. If the compost is too dry, add more greens. If it is too wet and sludgy, add more browns. Compost too wet: If your compost smells, it means it is too wet or there is not enough air in the heap and this will suppress decomposition. Increase the dry ingredients like shredded newspaper and turn your compost. If the pile is not hot enough, it will slow down the composting system. If there is not enough air, it will result in slow process. If you notice mosquitoes and flies over the heap, cover the top with news paper strips or with garden soil. I always throw shredded news paper on the top of the heap. Partially decomposed compost also benefits the soil. Bakery items like bread, cake, etc. Garden weeds: Use only those weeds which have not gone to seed. Weeds such as oxalis and onion weed with their bulbs should not be added to compost. Do not add any weeds which are either diseased or dead due to weed killer application. Droppings of cats and dogs.